national book store – Page 20 – Bookmarked! It’s a busy time for book events in the metro right now, and I’m tickled pink with excitement. First off is a project I’ve kept under wraps for the past couple of months: Fully Booked’s Moleskine Passions Launch & “Share the Loves of Your Life” Exhibition, where I was invited to be one of the contributors for the Book category. Moleskine unveils Moleskine Passions, a new thrilling collection of journals that celebrates passions as a way of life with a new inspiring exhibition: “Share the loves of your life” with Moleskine Passions. Over 150 specialists and celebrities in Asia share the loves of their life and reveal their creativity through notes, drawing, clipping…The passions notebooks created by the participants are showcased in over 60 spots in 12 Asian cities. Fully Booked brings part of the inspiring works to the audience in the Philippines. Artists and specialists from the Philippines were invited to share their passions on the new Moleskine notebooks, including Pastry Chef Aileen A. Anastacio (Recipe), Aaron Palileo (Wine), Blooey Singson (Book), Chef Bruce Lim (Recipe), Elian Habayeb (Music), Ines Cabarrus (Wine), Jeannie E. Javelosa (Wellness), Johnny Alegre (Music), Lyle Sacris (Film), Waise Azimi (Film), Yvette Tan (Book), and Agu Paiso (Wellness). Author SumthinbluePosted on 31 March, 2010 1 November, 2010 Categories Book EventsTags Ang Pambihirang Sombrero, book journal, Chocolate Kiss, exhibit, giclee print exhibit, Jomike Tejido, Man Asian Literary Prize, Miguel Syjuco, Moleskine, Moleskine Book Journal, moleskine exhibit, Moleskine Passions, Moleskine Passions Book Journal, national book store, Share the Loves of Your Life7 Comments on Events! Events! Three days to go until the Manila International Book Fair! A lot of people have been asking me for tips about the Manila International Book Fair, so I decided to create this (unofficial) guide based on what I’ve seen over recent years. I’ve been attending the MIBF for five years running now, covering events, shopping, and just generally enjoying the flurry of bookish activity around me. And every year, the exhibitors offer something new, and there is always a different lineup of special events to look forward to. This week I achieved a goal I’d set for myself a couple of years ago: to acquire privilege cards to three major bookstores in the Philippines: National Book Store, Powerbooks and Fully Booked. Having privilege cards to all three is convenient, albeit potentially hazardous to my wallet, because if I want a book from any of the three bookstores (haha, yes, I do buy brand new and full-priced books! ), I won’t have to worry about not having a privilege card to one store and having to postpone buying until I get to the other store. 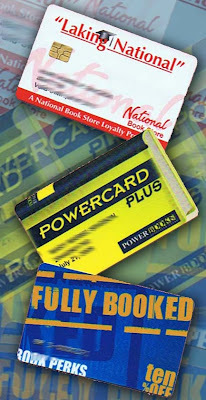 1) Powerbooks’ Powercard / Powercard Plus– The first privilege card I actually got was the Powercard, which I got in 2005, because I began to buy books with my own money when I started working and I saw it as a great investment, especially with the Harry Potter books coming out. By the time Deathly Hallows rolled around, I was able to upgrade to a Powercard Plus. I didn’t know about BookMooch yet at that time, so I bought P15,000 (around $300) worth of books in one year. Now that I have other book sources, the amount seems so obscene to me. A loyalty card that can be used as a discount card for a minimum purchase of Php 2,000. Powercard holders earn points for every purchase, which they can later use for future visits. An enhanced version of the existing Powercard, the Powercard Plus is a combination of a loyalty card and a discount card in one. For every purchase made, the customer is entitled to earn points and avail of a discount on valid titles. * Free Membership present receipt(s), single or accumulated throughout a one year period, worth P5,000 and above. Just present receipt(s), single or accumulated throughout a one year period, worth P15,000 and above. Note: Purchases using Powerbooks Gift Certificates and receipts of purchases which have earned or claimed loyalty points/discount cannot be used to apply for a Powercard or Powercard Plus. All applicants must present a valid I.D. * The Powercard or Powercard Plus must be presented upon reaching the cashier for payment to earn points and/or avail of discount. * No card, no point-credit and/or discount. Manual entry of card number is not allowed. * Loyalty points/discount can be claimed only during the transaction. * Points earned and the equivalent e-purse value are instantly updated in the system every time a purchase is made. * Purchases of Powerbooks Gift Certificates with cash or credit card will be awarded points. * Purchases using the Powerbooks Gift Certificate, E-purse and credit memo as payment shall earn no point. * Loyalty points apply after any discount. * Dome food and drinks, Arts Center, All Wrapped-Up items and service fees are not valid to earn loyalty points/ avail of discounts. * 10% discount on cash purchases, 5% discount on credit card purchases. * Discount not valid on special orders, bargain/ sale items, X items or XP items. * Each peso is equivalent to one point. Any centavo value will be dropped in the calculation of points. * The system automatically converts earned points to the equivalent e-purse value upon reaching the redeemable value (every 1,000 points). * It is an electronic purse where converted points are stored. This can be used to pay for purchases in any Powerbooks branch except for the purchase of Powerbooks Gift Certificates, Javaman food and drinks, All Wrapped-Up items and service fees. * E-purse value can be used only during the validity of a card. The unused e-purse value of an expired card will be transferred to the new card upon renewal, provided the card is renewed within the month from expiry date. * E-purse may be used to pay for renewal fee. * The cardholder may use any e-purse amount for payment. The remaining amount can be used at another time, provided the card is still valid. * Cardholder must present a valid ID when using E-purse for payment. * The Powercard or Powercard Plus is valid for three (3) years. * Expired card should be surrendered at the Customer Service for renewal. A processing fee of P100 will be charged. * Points earned by cardholders who do not renew within one (1) month from expiry date will be forfeited. * Any account that is dormant for a period of at least one (1) year will be cancelled and all accumulated points and e-purse value in the card will be forfeited. Cardholders may re-apply by accumulating the required amount of purchases (P15,000.00 for Powercard Plus; P5,000.00 for Powercard or pay the P100.00 application fee). * To replace a defective card, surrender the card at the Customer Service counter of any Powerbooks branch. Defective cards issued by Powerbooks will be replaced for free. * To replace a lost card, present valid ID at the Customer Service counter of any Powerbooks branch and pay the replacement fee of P50.00. * Points and e-purse value of a lost card, as reflected in Powerbooksdatabase, will remain in the cardholders account until the card expires. * Replacement of cards damaged due to the cardholders mishandling will be charged a P50.00 replacement fee. * Loyalty points and e-purse value reflected in Powerbooks system shall be considered official and final. * Powerbooks has the right to determine the point-value for every peso spent. * Receipts of purchases using defective cards must be duly signed by Powerbooks authorized personnel to be considered valid for crediting points. * Membership in the program may be revoked at any time should abuse, failure to follow the terms and conditions, or any misinterpretation prejudicial to the program take place. Those whose memberships have been revoked are ineligible to the rights and benefits of the program. purse cannot be used for payment; purchases will still earn points, and the cardholders account will be updated when system maintenance is complete. * Powerbooks has the right to cancel, modify, or restrict the loyalty/discount program at any time. In the event that the program is cancelled, cardholders will be notified accordingly. * Should Powercard and/or Powercard Plus be cancelled, the remaining e-purse value must be used within 90 days from the date of cancellation. Remaining points equivalent to less than P15 e-purse value shall be cancelled. * Powerbooks failure to enforce a particular term, condition, or guideline does not constitute a continuing waiver of the terms and conditions. * The Powercard or Powercard Plus is non-transferable. Points and E-purse value earned are solely for the cardholders consumption. * Powercard and Powercard Plus holders are subject to these Terms and Conditions and are deemed to have accepted these terms and conditions upon signing the application form. This reminds me — I have to renew my Powercard Plus this month. Not that it’s getting much use lately, I am still sore at them for canceling the Birthday Blowout (40% off on all purchases for one day in your birthday month) for Powercard Plus holders. But ooh, they have a new design, and I don’t want to lose points on my old card (around P300). The Cons: You need a minimum P2000 purchase for a 10% discount with the Powercard, and upgrading to a Powercard Plus is challenging (P15,000 in one year is a bit much, I think), AND no more birthday blowout (hmf!). 2) National Book Store’s Laking National Card (Laking National, loosely translated, means growing up on National Book Store, which holds true for most people in my generation) – I got this card in 2006, and I have to admit, it was because they were giving away a free bag with it, hehehe. I do regret not getting one earlier; I buy a lot of school supplies and art supplies, and National’s selection (and bargain books!) has improved immensely recently and this card has been getting a lot of mileage. I think I reached P400 until I caved and redeemed the points one day when I didn’t have any cash and I found the book on book collection. All valid Philippine residents with a valid I.D. can join the program. Children aged seven (7) years and above are also qualified to join. Apply at the Customer Service Counter of any National Book Store. Complete the application form and pay the P100.00 fee–or to get a FREE Card, just present receipts worth P5,000 accumulated over a 12-month period. Students can avail of the special application fee of P60.00 provided they present a valid school I.D. While waiting for the release of your new Laking National Card you can already start earning points by collecting your receipts. They will be credited when you claim your card. Upon signing up and renewal of membership, members receive 1,000 bonus points. Members who availed of free membership through accumulated receipts worth P5,000 will also get 1,000 sign-up bonus points plus a maximum 5,000 bonus points. Great reasons to become a Laking National member! * Members earn 1 Point for every peso purchase. Points are converted to P10.00 ePurse for every 1,000 points earned. ePurse may be used any time and at any branch, to pay for the member’s purchases. * Sign-up bonus worth 1,000 points. * Renewal bonus worth 1,000 points. * Discounts on selected books and non-book items on specific occasions. * Free gift-wrapping service on special occasions such as Mother’s Day, Father’s Day, Valentine’s Day and Graduation. * Free email alerts on in-store promotions and events. * Discounts and freebies from partner establishments. * Pre-sale privilege at the annual Cut Price Book Sale. * Free premium item for every P1,000 accumulated purchase during the program’s anniversary month (October). * Special privilege during in-store events, i.e. free entrance ticket for one companion. * Exclusive Quick Shop Service for a minimum purchase amount worth P1,000. Members may earn points for purchases in any National Book Store branch. Purchases valid to earn points are all books and non-book products, such as magazines, gift-wrapping materials, etc., services, such as photocopying, laminating, etc. Purchase of items on sale is also valid for points. Points will be credited after the discount. Purchases using the Laking National Gift Certificate or e-Purse as payment shall earn no point. Purchases of National Book Store Gift Certicates with cash or credit card will be awarded points. However, purchases using the National Book Store Gift Certificate as payment shall earn no point. Wholesale purchases with wholesale discount are not valid for earning points. The Laking National card must be presented upon reaching the cashier for payment to earn points. No card, no points. e-Purse may be used to pay for purchases at any National Book Store branch, except for the purchase of NBS Gift Certificates. The member may choose the e-Purse amount to be used for payment. The remaining amount can be used at another time. Only the member is authorized to redeem his/her e-Purse. NBS reserves the right to require the member to present a valid ID upon redemption. E-Purse value can be used only during the validity of the card. The unused e-Purse value or points of an expired card will be transferred to the new card upon renewal, provided the card is renewed within one (1) month from the expiry date. The Laking National card is valid for three (3) years. The expired card should be surrendered at Customer Service for renewal. A processing fee of P100 will be charged. Points earned by cardholders who do not renew within one (1) month from the expiry date will be forfeited. Any Laking National account that is dormant for a period of three (3) consecutive years will be cancelled and all accumulated points and e-Purse value in the card will be forfeited. To replace a faulty card, surrender the card at any NBS Customer Service Counter and complete the application form. Faulty cards issued by NBS will be replaced for free. To replace a lost card, present a valid ID at any NBS Customer Service Counter and complete the application form. A processing fee of P100.00 will be charged. The card validity will also be adjusted by adding three (3) years. For example, a member lost his card on June 1, 2006 and expiration date of the card is December 1, 2007. When the member applies for a card replacement on July 1, 2006, the new card that would be issued to the member will have the expiration date moved to July 1, 2009. Replacement of cards damaged due to the cardholder’s mishandling will also be charged a P100.00 replacement fee. The same rule regarding the expiration date stated above applies. Points and e-Purse values in lost cards will be transferred to the new card. Members are responsible for informing National Book Store of any changes in relevant personal information such as home address, email address, mobile phone, last name etc. Members may send the information via email at lnc@nationalbookstore.com.ph. * Your Laking National Smart Card is not transferable, including your points and e-Purse earned. * The loyalty points reflected in National Book Store’s records and the member’s card shall be considered official. * National Book Store has the right to determine the point value for every peso spent. * Membership in the program may be revoked at any time should abuse, fraud, failure to follow the terms and conditions, or any misinterpretation prejudicial to the program take place. Those whose memberships have been revoked are ineligible to the rights and benefits of the program. * Should the Laking National loyalty program be cancelled, the remaining e-Purse value must be used within 90 days from the date of cancellation. Remaining points equivalent to less than P10 e-Purse value shall be cancelled. * National Book Store will forfeit any earned Laking National points of items returned. * National Book Store’s failure to enforce a particular term, condition, or guideline does not constitute a continuing waiver of the term and condition. * Laking National members are subject to these Terms and Conditions and are deemed to have accepted these terms and conditions upon signing the Laking National application form. The Pros: A point system that’s convertible to cash, easy and affordable application for a Laking National Card (no need to upgrade), 20% off on the selected book of the month (right now it’s Angels and Demons) and a wide range of items to rack up points on! National Book Store clerks don’t always ask if you have your card and just go ahead and punch in your purchases. 3) Fully Booked’s Book Perks Card – I actually just got it this week, because for two years now I’ve been contemplating how I can accumulate P15,000 to get one or shell out P700 for it. I’ve been holding back on Fully Booked purchases because I didn’t have the card yet, but now all impediments (other than the financial one) have been removed: I finally got my Book Perks card today (thanks to a fellow booklover), and it came with a 20% discount voucher too! Sweet! Enjoy the perks of a Fully Booked Discount card by getting a 10% discount for cash purchases and 5% discount for credit card purchases on selected items. Option 1: Customers with a total purchase of P10,000 on a single receipt will be automatically included in our discount card list. Option 2: For accumulated purchases, a customer may avail his discount after reaching P15,000 within a year. Option 3: Or just pay P700 and enjoy your perks instantly. Discounts not applicable on magazines, office supplies and consigned items. Applicants must present a valid ID. 2. Each cardholder shall be issued a Fully Booked Discount Card, which is valid for 2 years from the date of issuance. 3. The Fully Booked Discount Card entitles cardholders to a 10% on cash purchases and a 5% discount on credit card purchases on selected items only. The discount does not apply to magazines, office supplies, CD’s, DVD’s, consigned items and gift certificates. Furthermore, no discount applies to purchases paid with gift certificates. 4. Unless otherwise stated, the Discount Card is not valid in conjunction with other promotions and discounts, or with direct sales discounts. 5. Cardholders must present their card to avail of the discount. No card, no discount. Discounts may not be applied retroactively to any prior purchases. 6. The Fully Booked Discount Card is non-transferable and may be used only by the individual whose signature appears on the card. Fully Booked may request for proper identification with regard to Discount Card transactions. 8. Fully Booked reserves the right to: (a) amend the Fully Booked Discount Card privileges and these terms and conditions, (b) to decline the renewal of any Fully Booked Discount Card membership without prior notice at the sole discretion of Sketch Books, Inc, and (c) cancel, modify or restrict the Discount Card program at any time, without prior notice. 9. To replace a lost card, cardholder should present a valid ID at the Customer Service counter of any Fully Booked branch and pay the replacement fee of P100. 10. Fully Booked reserves the right to withdraw, suspend or terminate any Fully Booked Discount Card membership, and refuse any re-issue or replacement of any Fully Booked Discount Cards on reasonable grounds. Reasonable grounds shall include (a) any abuse or attempted abuse of the Fully Booked Discount Card scheme, or (b) any use or attempted abuse of a Fully Booked Discount Card otherwise than in accordance with these terms and conditions, or (c) any reasonable suspicion of dishonesty on the part of the Cardholder in connection with the Fully Booked Discount Card membership scheme. 11. The Fully Booked Discount Card is the property of Sketch Books, Inc. If found please return to Fully Booked at 902 Bonifacio High Street, Bonifacio Global City, Taguig. The Cons: Not easy to acquire (again, P10,000 outright purchase, P15,000 in one year or P700 — this is why it took me a long time to get one! ), no point accumulation system, not valid for sale periods, and only valid for two years! Squee!!! Finally I have all three of them! I’m partial to the Laking National Card, but I’m sure my Fully Booked Card will be used a lot this year, and I will be renewing my Powercard Plus. More books for me!